It’s often hard to find the exact time when an action changes from being something you do every so often, without a lot of planning or forethought, into a fully blown habit. And which after a while becomes more like a cherished ritual that you cling to like you might a lifeboat or a ticket to see Nick Cave. I think for most or at least a lot of New Zealanders the ritualistic drinking of espresso coffee at times could match many ancient cult rituals. As for when this change occurred … well for those of us old enough to remember I feel like it was in the late 80s, early 90s, when with the help of a few hallowed coffee pioneers we sampled for the first time the delights of the blessed drink. A few factors contribute to a person becoming – shall we say – addicted to their morning coffee. There are the physical ones. That is, coffee does not just contain caffeine, which is highly addictive, but also contains a compound called cafestrol, which has opiate-like properties. And as well as this compound there are numerous others that when mixed together all contribute to one needing – as well as wanting to wait sometimes for quite a while for – your first espresso of the day. But I think what can really get you hooked is something more metaphysical. It’s the constant drive to find the perfect blend, roast and cup. Because, you see, as well as being a science, roasting espresso is very much an art. Have you ever watched a coffee roaster while they are at work? The way they listen intently with their whole body for the final crack, constantly sniffing the beans while they roast, and the air to check that the atmospheric pressure is just right. And this is after, skillfully using all of their nine senses, they have chosen the perfect type, origin and blend of beans! You see, I have just once or maybe twice almost got there. I have tasted espresso that is far more than just a drink. It is that perfect blend of bitter and sweet, chocolate and all the other aromatics. It excites your body and your mind and makes you feel like you are the luckiest person alive, like the world and everyone in it is wonderfully interesting and you are quite happy to sit just where you are and observe it all. You can feel and taste the integrity of the bean and the roaster and you feel a part of something very special. And once you have tasted espresso like this you do not forget and are constantly searching to repeat the experience. Which is what led me to be so immersed in the process of coffee roasting that at times I would feel that I was absorbing so much of it through my skin my blood must surely have turned a lovely shade of burnt umber. And from this immersion I have gained a deep respect and love for … the bean, and all that it brings forth. But I am in no way the first. That title, it is said, belongs to Kaldi, a Ethiopia goat herder who lived in 850 AD, who noticed that when his goats ate the beans from the ancient coffee trees they became very exuberant. When he told his priest about this, the priest tried brewing them up and found them most useful in keeping himself awake during long prayer sessions. Whether this is really how coffee was first discovered or not … it doesn’t really matter. I am sure if it wasn’t Kaldi it was someone very like him. And so, began the long and varied history of the coffee bean and drink. So, whether you take coffee to keep yourself awake during a night of cramming for exams. Or to take you to heightened states in a religious ritual, as did some Sufi mystics, or simply because you enjoy the taste, I would say jolly good on you. And while some say it has negative effects on your health, there are just as many listing huge benefits, especially to your liver, as long as it is had in moderation I suppose. And what is moderation? Yes, well that is the question. I always thought two double shots a day was a good safe and reasonable amount, but then we are all different. Where is this ramble leading? Well, often I hear people say ‘I should give up coffee’ or ‘I drink too much coffee’ and I find this alarming and a little sad. Our lives are often very complicated and full of things we have to or should not do. But your morning espresso ritual can be one of the few moments where with not much fuss or expense you can have a moment that is yours, before the day crashes in. 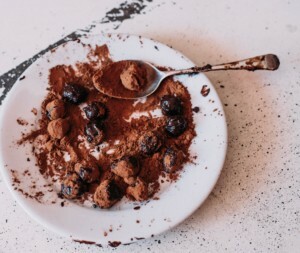 So in case you are looking for more ways to enjoy espresso, here is a wee recipe for espresso and chocolate truffles. 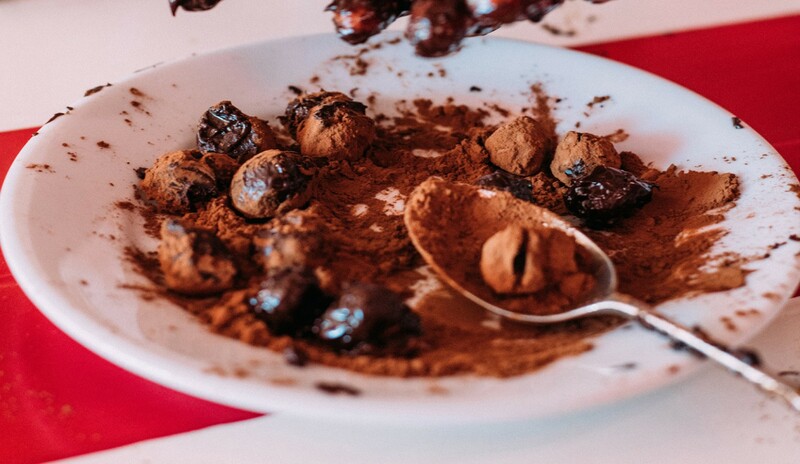 Put the chocolate and coffee into a bowl and then sit it over a small pot of simmering water, making sure the bottom of the bowl does not touch the water. When the chocolate has melted, take it off the heat and stir it into the coffee until it is smooth. Then leave it at room temperature to set. 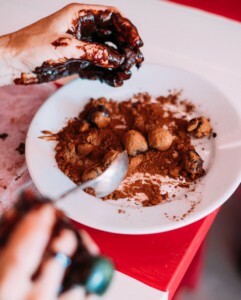 Then you can take small teaspoon full and roll it into balls, next put the cocoa onto a plate and roll the truffles in the cocoa. Leave them at room temperature for a few more hours and then store them in the fridge.